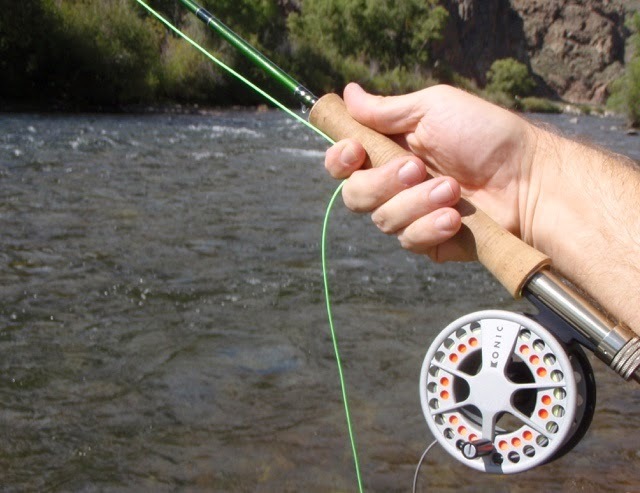 The primary objective of the annual Gunnison trip is to catch big fish. This requires that I get my fast action Sage VPX 6 weight out of the bag when fishing big water in pursuit of the large trout and salmon. When I fish a fast action rod, I like to use a fly line that is a bit heavier so that I can load the rod to take advantage of it's capabilities. I was looking for a line to use for this year's trip, and discovered the RIO In Touch RIO Grand WF6. The line has several features that I liked immediately. There are two loop connectors on each end, and the colors are bright and visible. This fly line uses different colors to indicate the different parts of the line, including the front taper, the body, and the running line. This intrigued me, since I am a "feel" caster, and not very technical. While casting the line at distance on the Gunnison, I found it extremely helpful to note the different colors when loading the rod. I was able to get more distance, and more accuracy by noting the different sections of the line as they flew through the guides. The In Touch RIO Grand line is one full line size heavier than the industry standard, which I really appreciated in my fast action rod. Rio says that this line contains an ultra-low stretch core for easier line lift, more precise mends, and better cast timing. Time spent with this line verified these claims as accurate, as I noticed that the line seemed more "connected" to the rod and the reel. Hook sets also seemed to be better...while impossible to truly quantify, it seemed as though I lost fewer fish on the hook set, which would be due to the low/no stretch core. Color different between the body and running line. 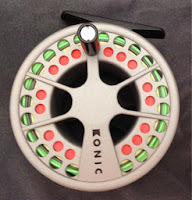 I cast streamers and heavy flies with ease during the time on the water. On one occasion, the trout started looking up, and I spent an afternoon fishing a size 14 parachute adams using this fly line. I was able to cast this line into tight spots landed quite a few trout on the dry fly. This fly line is very impressive, and I would recommend it. The coating is very slick, and the weight of the line felt perfect for a fast action rod. The line retails for about $89. 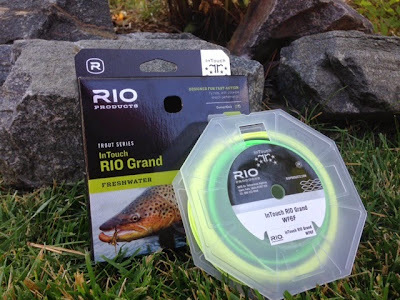 The In Touch RIO Grand fly line earns Dry Fly status. I really didn't notice you losing fewer fish down in Gunnison, Mike, but I'm glad you enjoyed your new line. Anything to help improve your catch rate would be a great purchase. Thanks for the review, Mike. I am due to replace the summer skamania line, so I just might give this a shot!